New Berlin Appliance Repair is a family owned and operated company in Waukesha County Wisconsin. We understand a broken appliance is an inconvenience and offer same-day service for all residents of New Berlin in order to fix the problem fast. Our customers know they can count on us and we guarantee satisfaction! Our appliance repairmen are trained and experienced in refrigerator repair, stove repair, washer repair, dryer repair and dishwasher repair. We’re even able to repair the latest models of kitchen and household appliances with touch panels and smart technology. We load our service vans with manufacturer parts and can repair all major appliance brands – including Kenmore, Whirlpool, Bosch, Sub-Zero, GE, Frigidaire, KitchenAid, Jenn-Air, Magic Chef, Maytag, Samsung, Wolf and more. All service includes a 12-month warranty on parts and labor and a written estimate before we begin. 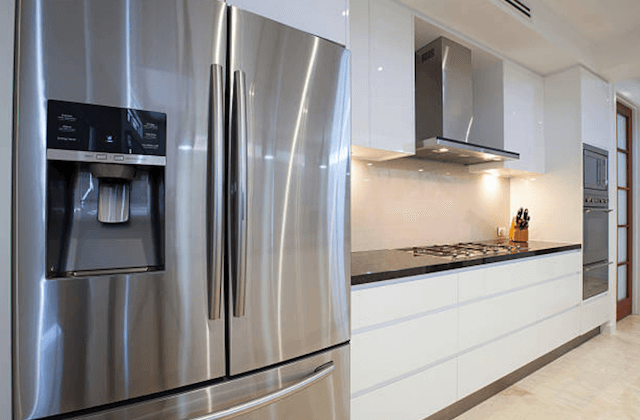 New Berlin Appliance Repair specializes in refrigerator repair and freezer repair – including stand-alone freezers and commercial models. We are able to fix cooling issues, door problems, water dispensers, ice makers, smart technology, condensation and leaks, burnt-out bulbs and other common problems. You might consider us dishwasher repair experts. Why? Because we receive more service calls for dishwashers each year than any other type of common kitchen appliance. Our technicians repair leaks, control boards, issues that cause cloudy glassware and dirty dishes, burning smells, unpleasant odors, loud noises and more. Dishwasher rack repair is also very common. And we offer routine dishwasher maintenance in order to prevent issues that occur over time from general use. Our services include stove repair and vent hood repair – including commercial models. We act fast when it comes to fixing an oven or range hood. After all, dinner depends on it! Our local technicians repair ignitors, burners, ventilation issues, control boards, pilot lights, gaskets, relays and range parts. We repair both gas and electric ovens. 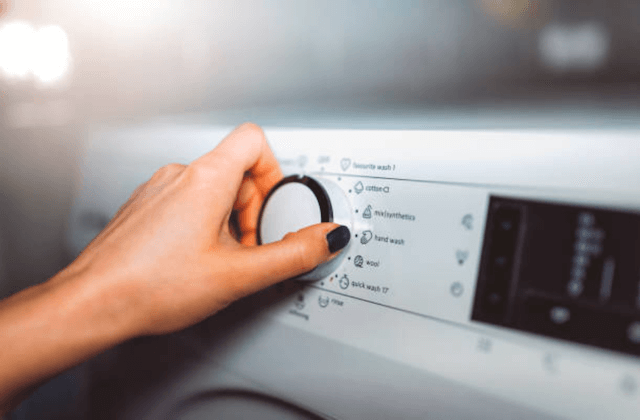 New Berlin Appliance Repair is able to fix common washer and dryer problems. We have the parts and experience to repair agitation issues, excessive vibration, loud noises, burning smells, door problems, odors, wet clothing, control boards and other common washer repair needs. Don’t let dirty laundry get out of control. Call us today! “The repairman, Ryan, was so friendly! He arrived to repair the water dispenser on our refrigerator during our toddler’s nap time and was careful to be very quiet during the entire appointment.” – Courtney F.
“I recommend New Berlin Appliance Repair to all my friends and family.” – Susan P.
“An affordable appliance repair company isn’t always easy to find. I called three companies before I decided to hire New Berlin Appliance Repair. Their quote was the best and their service was excellent! Next time, I’ll call them first.” – Lisa L.
“I can’t believe how fast New Berlin Appliance Repair fixed my broken stove! We have an old GE stove and they had all of the parts on-hand. So impressed!” – Patricia R.
“Great experience! Definitely recommend.” – Gary W.
Q. SHOULD I REPAIR MY APPLIANCE OR SHOULD I REPLACE IT? A. A non-functioning appliance gives you two choices. You can schedule appliance repair and if it works you have a working appliance still. Or you can buy a new stove, dishwasher, refrigerator, or washer and dryer to replace the broken-down appliance with a brand new one. The key to this issue is the age of the appliance. Each appliance has an expected working life. If your broken appliance is in the early or middle years of its lifetime, we suggest scheduling a service call to make repairs. If your appliance is near to the end of its expected service lifetime, we will usually recommend buying a new model that your budget allows. Q. DO YOU HAVE A GUARANTEES AND WARRANTIES? A. All of our labor and parts have a 12-month warranty. We always use manufacturer parts for GE, Whirlpool, KitchenAid, LG, Frigidaire, Kenmore, Sub-Zero, and other major appliance brands. We believe these parts work better and when you use them, you keep the manufacturer’s warranty valid. And, if any problem persists or returns after our technician leaves, always call us right away! Q. 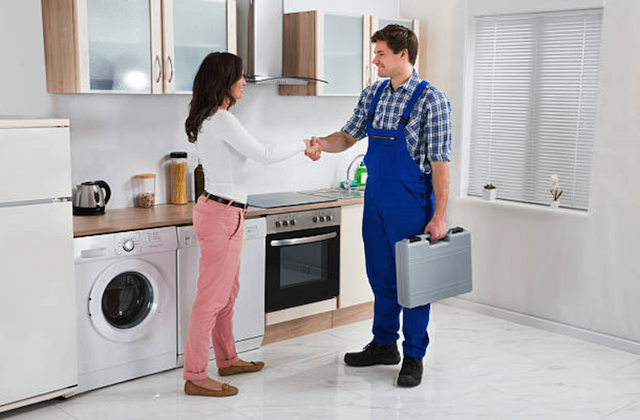 WILL YOU REPAIR MY APPLIANCE PROBLEM ON THE FIRST VISIT? A. We estimate that we can do this about 95% of the time. To get the job done on one visit, we stock our vans with manufacturer parts used for more than 90% of all service calls. And, we carry all the needed tools as well. It is a rare problem that requires us to come back a second time to finish the job and then there is no additional charge. Q. WHAT IS THE TIMEFRAME FOR YOUR APPOINTMENTS? A. When we say same-day service we mean same-day service. We will schedule a 2-3 hour block of time during which our technician will arrive at your home. We respect your time and will make every effort to come on time, get the job done promptly, and leave you with an appliance that runs like new. And, our repairman will call you 10-15 minutes before they arrive at your home. Q. CAN YOU GIVE ME A FULL LIST OF THE BRANDS OF APPLIANCES YOU REPAIR? A. We repair virtually all major household appliances, brands, and model. Please see the full list below. But, if you happen to own a brand that is not on our list, don’t worry! We can easily order the parts need to fix any brand or model.